The concern is again raised by many residents that if the Riverine area (Scholtz River) adjacent, and below the Country Village is not adequately cleared of alien vegetation and widened to accommodate the expected water flow, that will occur during heavy rainfall in the catchment area of the river, many of the areas adjacent to the Scholtz will again be flooded/inundated. 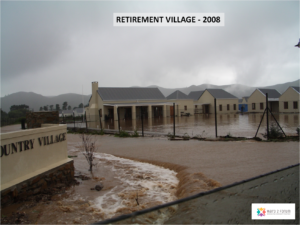 In a bid to alleviate the looming disaster, it is requested that some remedial work be done, as a matter of urgency, on the lower part of the Scholtz River to mitigate the chances of flooding in and around the Country Village in particular. Derek, thank you for such a comprehensive report on the flood issues, I remember the 2008 event very well and any action to avoid this in the future would be energy and money well spent. The immediate residents may not be aware of this otherwise they would likely keep the route clear of vegetation themselves? but I wish you all the best with your task team. Thank you Mike. We are very worried about the situation as it is, some clearing of the river bed is currently being done adjacent to the Retirement Village but we feel this is not sufficient to prevent a major disaster. Hopefully this report will precipitate some awareness and hopefully may result in some action being taken. The concern is that insurance companies may refuse to payout in the event of claims if the required remedial work to mitigate flooding is not done. Thank you Derek for all your time and effort in bringing about awareness of this extremely important issue of probable flooding in the near future. Thankyou for getting involved, and initiating the rehabilitation of the Scholtz river. I have been studying the natural recovery of flood-damaged riparian areas in the Cape, and feel that it is important that the dynamics of riparian vegetation, and it’s ability to cope with floods are considered as a mitigating option – when planning to rehabilitate a river in such a key recreation area. Riparian vegetation is a dynamic, highly specialized, water-holding vegetation that is distinctive to other surrounding vegetation and connects the river to it’s floodplain. Often, pioneering Renosterbos shrubs and grasses will colonise a river and assist it to succeed to a higher riparian community that includes riparian trees. It is critically important that rivers, vulnerable to flooding are stabilized by natural riparian grasses and shrubs to avoid erosion and siltation. A buffer zone on either side of the river should be established – incorporating riparian trees that will slow down any floodwaters, and stabilize the soils. The riparian forests that line the – at times, huge rivers that flow from Oubos forest (near Riviersonderend) are a good example of how trees can protect clay riverbanks, as the clay roads on either side of the river have not been disturbed for at least 80 years, judging from the size of the trees. Another good river to observe is the Disa River above Harold Porter Gardens that has suffered severe flooding and also sharply turns from a steep gradient. This river has suffered severe erosion and yet, has made an amazingly swift recovery. Palmiet has naturally colonised the riverbanks, and allowed for the establishment of deep-rooted, riparian pioneers such as Keurboom, Fountain Bush and Podalyria, Water Witels and Cape Holly. I am very concerned that a future flood may possibly do irreparable damage to the Scholtz riverbed, and feel strongly that the safest and least expensive solution right now, would be to secure the riverbanks with riparian grasses and bushes, and to create a buffer zone of trees. At the moment, the roots of the trees that were cleared, are still holding the banks together and could provide a secure habitat for riparian vegetation. I would be happy to assist with naturally rehabilitating the Scholtz River, with the guidance, and direction of riparian experts.